Jarno Kettunen is intrigued by high fashion, luxury, music, and popular culture. As a warmly welcomed guest in these worlds, he translates his observations directly to wild and expressive drawings. 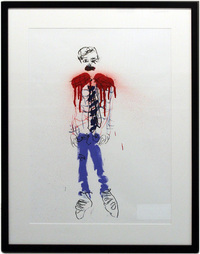 Kettunen’s highly personal style of drawing is inspired by the techniques of fine arts such as (neo)expressionism. Jarno Kettunen is most known for his action drawings, which he makes directly at the back stage of fashion shows, concerts, etc. or as a performance in front of the audience. These spontaneous sketch like drawings describe the mood and energy of high fashion collections or rock concerts in an expressive manner. 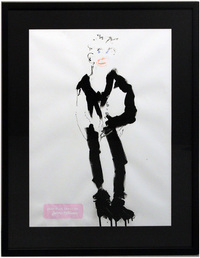 After making live action drawings at fashion shows such as Jean Paul Gaultier and Dior Homme, Kettunen’s drawings have been in increasing demand in the worlds of high fashion, music and popular culture.